On this day in 1949, Alla Borisovna Pugacheva was born and went on to become the Soviet Union’s and Russia’s most famous, celebrated, and prolific singer. She was already well known in 1975 when she took the Grand Prix in the “Golden Orpheus” music festival for the song “Harlequin,” which went on to be one of her biggest hits. It was only overshadowed in 1977 when she starred in the hit movie “The Woman Who Sings.” The soundtrack album released in 1979 sold more than 55 million copies in the Soviet Union and other countries. Over her long career, she issued more than 100 albums which sold more than 250 million copies. Her thick red hair and extravagant costumes were as instantly recognizable as her powerful and extraordinarily emotional voice. She was an music icon in the U.S.S.R. and around the world, a singer and actress who created the image of a vibrant, modern, even slightly scandalous celebrity. Although she “retired” from the performing several times, she still sings in special concerts and events. Pugacheva has received hundreds of musical and state awards during her lifetime, both in her homeland and abroad. She received the People’s Artist of the U.S.S.R. award just before the dissolution of the Soviet Union in December 1991 and the State Prize of the Russian Federation in 1995. Pugacheva has been married five times and has three children and three grandchildren. Her current husband is the comedian Maxim Galkin, who is almost 30 years her junior. Their twins from a surrogate mother were born in 2013. 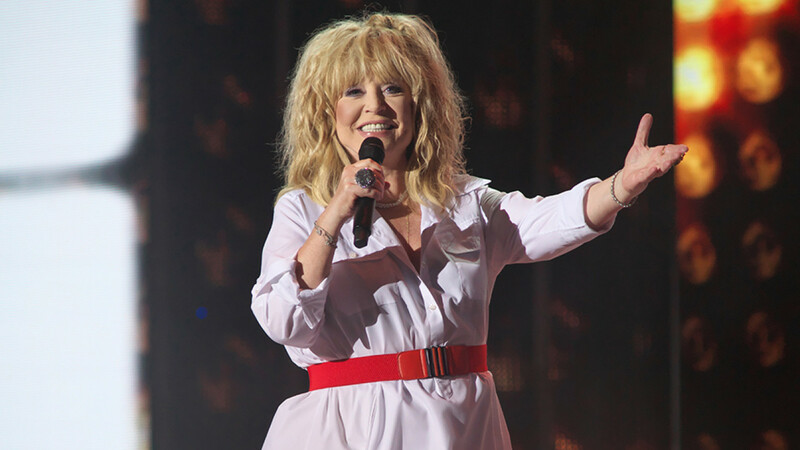 In honor of Pugacheva’s birthday, Gosteleradiofond — the State Television and Radio Archives — released a clip made in 1984. Filmed in Sochi, the video of the song “Iceberg” was deemed too risquee by someone in the state arts or political leadership, and it was only shown once on Leningrad television.